I've been a bit of a stamp collector on and off over the years. Not in any serious way, I just like the fact that they are little artwork prints. Some of the stamps I've picked up have been comics related. I thought I'd share them here. This stamp is from an early 1990s UK commemorative set. The theme was not comics. It was a series of characters receiving or sending messages. 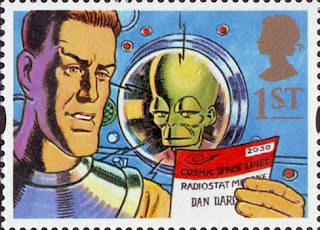 So here we have Dan Dare in the future - in fact the year 2030, as opposed to the 1990s, the time Dare and co. occupied in the original comics - reading a "Cosmic Space Lines Radiostat Message". The Mekon appears to be sneaking a peak at Dare's messages too. I have no idea who drew this. If anyone does, please let me know.